I’ve been going through quite a lot. I had a “long distance relationship” that was never really official or really defined. I went and saw her back in February only to find out that she lost interest in January and never gave me a “proper” goodbye/breakup. After spending 10 days with her, and having the entire trip just feel off. She gave me around a minute to tell me she felt everything was complicated and she lost interest during the goodbye at the airport. I had that feeling that we would be breaking it off but we only had a minute to say our feelings and it didn’t feel like we had enough time. I got back home and wrote her a long message describing my thoughts on the situation. She responded that she would get back to me the next day and I told her to take her time. Fast forward a month, and I got tried of waiting. I wanna piece together… the reasons. Rejection without reason/feedback… is one of the worst feelings we go through. It’s why I feel I’m horrible at dating or relationships. 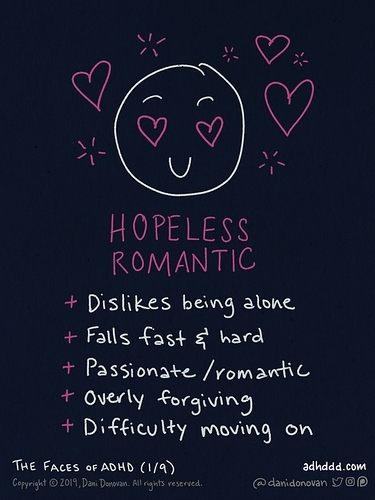 This graphic just describes me currently to this day. Treated like I don’t matter. It’s a privilege to give me her time. It finally hit me last night/this morning that I deserve so much more and better than what she was giving me. I was allowing her situation and LDR difficulties to be ignored instead of addressing the problems. I also feel like she needs to date someone in her native language too because she just didn’t have much emotion in trying to talk to me. It felt like a chore. It didn’t feel natural for her. What I take away from this is that she just wasn’t ready for a LDR and that we aren’t compatible at this stages of our lives. She didn’t give me her time. I have personally felt like she found someone local to her area, speaking her language and anything relationship/dating wise felt natural and right for her. I personally don’t blame her that much too if she wanted someone else, she never dated much before me. She did need to tell me though… and that’s what I’m struggling with. I never felt like I got an answer or closure. Now I’m back to trying to date again in the SF Bay Area… an area where dating and finding someone is a massive struggle for a guy. Online dating or finding someone is just… very difficult for a guy like me because we are a dime in a dozen. I’m still very socially awkward. I don’t do well in bars or typical social situations because of my hearing issues. Ugh, I’m so sorry. I feel this. I’ve been single for the past two years and before that, I was in a LDR where we only saw each other in person twice in the two years we were “together.” So I basically feel like I’ve been single for the past 4 years at least. 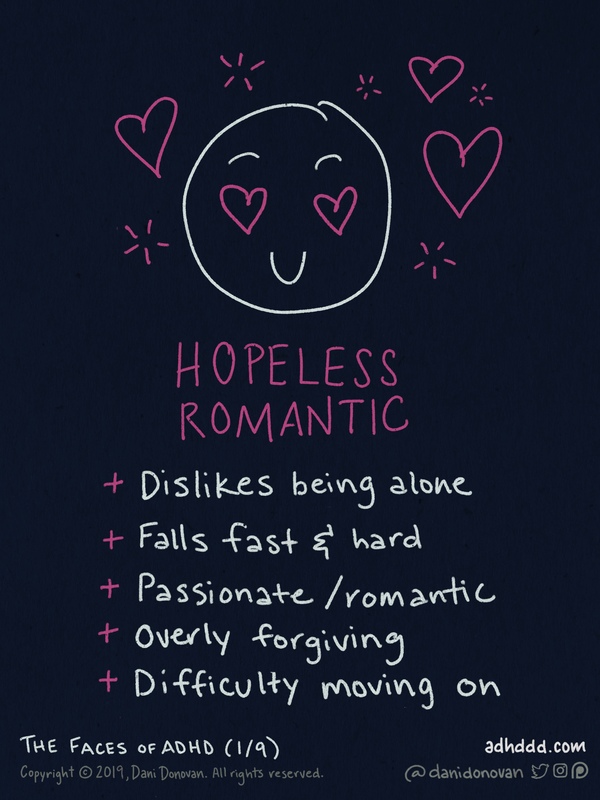 I’m also the Hopeless Romantic and I deal badly with rejection (or even perceived rejection) (yay SRD!) and meeting single people in the Kansas City area isn’t easy for me, especially in my age range and with enough commonality that there’s a possibility of romance. I’ve been working with my therapist about how to deal with the pain of being lonely and what to do about it. You invest all this emotional energy and time and money into a relationship and when it feels like you aren’t getting the same in kind, it hurts. And then you feel like you’re being disrespected and undervalued and ignored and it hurts even more. I don’t have any good advice or answers, but I know your feels and I guess it’s good to know I’m not alone in this. In reality, the distance, age difference, and where we were in our lives was writing on the walls that I ignored. I’m not saddened that it ended, I went into it knowing it could end very easily. I even saw her having so much more enthusiasm speaking in her native language so if she found someone locally who spoke her native language, I honestly cannot blame her that much for finding something else that works much better. I feel that I should have more than a minute of a talking exchange to end it though, or a heads up telling me feelings had changed. That’s what upset me. The way she went about ending it and believing she was clear… I don’t believe she’s aware of how much it hurt me. What I am taking away is that effort needs to be reciprocated at a similar level. Yes school, work, health and other parts take away time but I felt second class/afterthought for a few months before it ended. I didn’t want to let it go because my area is just horrible for dating as a guy (ratio levels are abysmal). I don’t feel like I’m gonna get another chance with someone like her again. I get how you feel men, through my second year in school a girl just played with my heart and I was too dumb to see it in time. What’s worse is there wasn’t really any reason she just lost interest and took a long time before I could confront her about it I started feeling like there was a problem with me. Plus I think I unconsciously jeopardise my chances with girls and I cant explain how and I find it hard to let people get close to me. It may also be that there were cultural differences that made it so that signals that she thought were clear, really weren’t. There are quite a few different cultures that do the passive-bad-social-news thing, or even just have different signaling due to different social norms or faux pas. What makes this worse/more complicated is that there often isn’t a reason someone loses interest, which can make people feel like they can’t just break things off, which just kinda compounds everything. And when you add in long distance into the mix, it just turns into a hot mess. Emotions are hard, romance is complicated and social interactions are a minefield of expectations. Thing is, there’s no “right” way to reject someone. There are ways that are “more wrong” and ways that are “less wrong” but in the long run, ALL of them are REJECTIONS OF THE OTHER PERSON. So, if you are the recipient, you end up not getting as much emotional support out of the situation as you might have needed. I don’t approve of the way she kind of avoided the topic and then outed it when it was way too late to hash it over, but I also don’t want to say that “she should have done a better job” because, as mentioned, there’s really no such thing as a good job, IMO. So, I’d focus on what ADHD implies about this situation. I really like the graphic (the “faces” of ADHD, that website seems to be upgrading right now, but I’d like to see the other “faces” and what they’re like, I’ll bet I experience a lot of them too) and feel like that’s one way to cast yourself in this situation. But you can CHOOSE to cast yourself a lot of other ways. It might take too much executive function for you – I certainly have a hard time doing things that involve deciding what I should be thinking about – but somewhere inside you is the capacity to decide to have different responses to the situation. In fact, that’s what a lot of life philosophy is all about – not, learning to get rid of bad situations; but rather, learning to have the most effective, most survive-able, most sensible response TO the bad situations. If ADHD takes away some degree of ability to do that, then we all need to develop other methods of doing it. It’s such a central life-skill, that we can’t simply neglect it in hopes of things “working out” on their own, the way we can (for example) neglect cleaning up the house until the deadline finally hits and mom’s car is pulling up into the driveway. but I also don’t want to say that “she should have done a better job” because, as mentioned, there’s really no such thing as a good job, IMO. That’s completely fair to say and I just have been dealing with difficulty with moving on. Was it because of the distance or did I screw up in someway and tell me so I know for next time. Like I care about her still. I’m actually quite happy that I don’t have to deal with long distance anymore. There was too much other things that didn’t line up at all too so overall it’s for the best. I’m more afraid and angry that I had to go back to doing online dating/date in my area thats just… awful. This was the first girl I felt like I didn’t have to compromise at all. She told me “I found the perfect guy” in a very vulnerable moment, and she’s not a liar at all. But the distance and her attention towards school just killed the vibe and what we had, she acted the way she did because I do feel she still believes in everything she said… the distance and school worries was just too much and she couldn’t handle it, process it or be transparent about our relationship. That’s what I believe, and I am 95% damn certain that’s how she feels. She has avoided me because she doesn’t want to hurt me, the problem will just go away if she doesn’t address it. But what would be best and what I wanted her to understand is that it’s ok to hurt me now instead of linger and let the guilt/unknown hurt me later. Sounds like you’re having a horrible time, I’m really sorry to hear that. I have one main bit of advice that I hope will help you. It’s not a numbers game. You only want to find one person, so it really isn’t terribly relevant whether there are millions or just a few people to ‘choose’ from. Okay, that may be a slight exaggeration. If you were destined to spend the rest of your life on a desert island with just three people who were horrible to you, you would probably be right to choose none of them, and run fast if any of them chose you. But in normal life, it’s about meeting the right person at the right time, and numbers don’t seem to have as much influence as other stuff, like state of mind, openness to a relationship, knowing what you want out of life (roughly), that kind of stuff. Jeez, how does anyone ever find the right person? The odds are always in favour of it not happening! But still, there are some very lucky people who find each other. It does happen. Meanwhile, spend some time working out what makes you happy, make some small changes for the better to your daily life, and believe that, if it’s meant to be, it’ll happen. You are worth holding out for a good relationship, you deserve to be respected and loved for who you are. We all deserve this. Never settle for less! (unless it’s just, cough, a mutually beneficial temporary arrangement and you’re both clear on that). You can’t very easily look for ‘the one’, you can just be ready to notice if your paths cross. Yes agreed, relationships are already an oddball statistic whose numbers are out-lying from all the other types of numbers we often use to judge our lives. As LforL says, it’s not a numbers game in the usual sense that poker, roulette, and getting the green M&Ms are numbers games. So, although there may indeed be “plenty of other fish in the sea” that’s kind of a stupid point, if you wanted the fish that already got away. Additionally, I have to regularly remind myself, that ADHDers often have some weaker skills at maintaining relationships in odd categories that aren’t intuitive to any partners (f.e., don’t take hints very well? and yet notice and identify many small and sometimes indistinct details? how contradictory, and counter-intuitive, is that? imagine trying to figure out somebody who could only do detail-study when it had to do with coins in the gutter but not with “does this dress make me look fat honey?” type communication!). In general, a lot of communication issues can be helped enormously by agreeing/understanding that the default position is love and support, not being out to get you. So if one of you thinks the other one is being mean or inattentive, it helps if you’ve trained yourselves to actually ask. I actually started a meeting with my new boss with that last one. He had sent me an email that I had been really cross about. But that was not his intention at all! So we got the misunderstanding out of the way, laughed about it, and had a really goid meeting after all. If I had not taken someone’s advice to check his intentions I don’t think we would have had such a good meeting. And yes, that’s work not personal stuff, but it is about communication. Amd it goes to show that we can learn ways to help ourselves. agreeing/understanding that the default position is love and support, not being out to get you. wow great reframe … excellent little reminder … very useful thang … I think I’ll copy that out and put it in my BuJo and … I dunno, decorate it, or something. I have heard it said that everyone has same basic needs: love, safety, food, peace, companionship, autonomy etc. etc. but our strategies for meeting these may be different. So it is good to differentiate needs from strategies, or try to understand from other people’s reactions what their underlying needs may be. For example, an ex may not wish to go in details as to why she broke off the relationship – it is even harder to be open with someone you are breaking up with – due to a need to protect herself. We can guess as to the reasons but some mysteries may never be solved. … Just in case this came across as a bit of a facebook plastic perfect world kind of thing. I do think my relationship is bloody brilliant, but in my book, brilliant overall still has room for glitches. Interesting thing about “glitches”, I remember a quote but forgot who it was from, or maybe a saying, you know what it’s like. But it went something along the lines of ‘You never truly know your partner until you’ve have a massive fight’, basically you don’t know eachother properly to be in a long-term relationship until you’ve seen eachother’s worst and still stay together. Depending on the size of your country, I guess. For Luxemburg, pretty sure you’d be fine. I’m struggling again. I had a few good days, thought I was getting over it. Then today it just hit me like a ton on bricks. I feel like I’m not gonna find anyone like her again. Sorry you’re going through it. One day you’ll find someone with all her important good points and without whatever it was that led to the break up. And thanks to her, you are another step closer to knowing what you want and need from a relationship, and that you needn’t settle for less than what you had out of this one. I lost a relationship like that once, and of course it hurt like hell, but even just a few years later I realised that this experience was part of what led me to the even better relationship I have now. (and they don’t look anything like each other, that’s not the point really). One day the pain will be over, Scot. Meanwhile is there any music you can play that will give you a break from the misery? Something upbeat that makes you smile in spite of everything? And I was successful in all that. I was willing to go out of my way for her, to actually have interest in learning her language, to consider uprooting my life to just go be with her if things did work out in the long distance. To have an incredible feeling and experience from being with her felt truly unique and special. But with that, I ignored issues and problems. Jessica has said before about people pleasing and I felt I did that with my previous relationship so much. I wanted to have her know that I would do 10x more things, completely go out of my way to make it work JUST FOR HER. Never before in my life have I considered doing anything like this ever before. But it just showcases how love and being infatuated with someone can be detrimental. What happened last night was me falling to those tricks in the moment. I feel better today because I had time to process and remember why things didn’t work and that we are just in two completely different places to make a relationship work. We didn’t breakup because I did something wrong or she did something wrong. We broke it off because she can’t put in the effort or time in a long distance relationship and putting all her effort into school. That school system, especially for women, just takes all their time. She didn’t put effort into me. I people pleased and didn’t address things to make a LDR work. She posted that she is coming back to the states yesterday. We broke it off where she didn’t know she was coming back. I thought one of the reasons was because she just simply wanted to stay. But she just posted that she is visiting the USA. She may not be visiting my area at all, and why should I care? If she reaches to me and says she’s visiting and wants to see me, she will put in that effort for me. I didn’t think of all this last night, I was falling victim of “oh she just doesn’t even care for me to let me know” but she doesn’t need to! I feel this typical and a problem for any ADHD going through relationships. We over think everything. We people please everyone. We feel owed the same way of thinking from others that we think in the moment. We make assumptions. We don’t take a step back and think. I’m friends with her, I have to treat it like any other friend I know on that distance level. There’s still a tiny part of me that hopes that she reaches out and says “Hey… I’m coming back and want to see you again” while we are both single and not seeing anyone and trying again. But I am not banking on it. I am not waiting a chance, I’m going to live my life and if I find someone awesome before a tiny/fraction of a chance like that happens. I have to also remember all the positives, all the doors that were opened for me for taking those chances to ask her out, feeling confident in my own skin, not being intimidated. Anyways… sorry to always ramble on like this. She’s unique. She’s special to me. I have to put my boundaries on. I have to step back and think realistically. For me not to feel like I need to compromise and not to people please. And just know that there will be someone there to put in the effort for me, to accept me for being me. You came a long way with this very special woman, stretched your boundaries in a good way (self-confidence etc), and one day you’ll be able to do all that with someone who is able to do that for you too. It’s not just a question of whether you fit as people, it’s also timing. You have to both be ready for the same level of commitment at the same time.